Calcium signals play a key role in several cellular functions, including gene expression, synaptic transmission, cell cycle progression, and apoptosis. Calcium levels must be accurately controlled in spatial location and signal kinetics to achieve these tasks which is done by many calcium-binding proteins located throughout the cytoplasm. These proteins include calretinin, calmodulins, parvalbumin, calbindins, troponin C, and S-100 proteins. Calretinin is a 29 kDa protein, encoded by CALB2 gene. The presence of calbindin and calmodulin has been documented in odontogenic epithelium during tooth development in rat. Calretinin plays a role in diverse cellular functions, including message targeting and intracellular calcium buffering and regulator of apoptosis. It is expressed in neurons, mesothelium, retina, adipocytes, hair follicles and Leydig and Sertoli cells More Details of testes. It is also expressed in the odontogenic epithelium of tooth germs, tooth pulp, and many normal and neoplastic tissues. It can also be demonstrated at precise moments of the cell cycle, in particular G1 phase and mitosis, and is associated with kinetochore microtubules which may indicate a role in chromosome separation. Recent results proposed that calretinin acts as a calcium modulator rather than a calcium buffer of the neural tissues., Calretinin has been established as a highly sensitive, specific immunohistochemical marker for benign and malignant mesotheliomas and certain brain tumors and also to differentiate between the mesotheliomas and adenocarcinomas.,, There is much discrepancy in the expression of calretinin in the odontogenic tumors. Only a handful of literatures exist regarding calretinin expression in the odontogenic tumors. Despite the expression of calretinin in these odontogenic tumors, the role of calretinin in the pathogenesis of odontogenic tumors still remains unknown. Therefore, the aim of the present study is to assess the expression of calretinin in selective odontogenic tumors to gain a better understanding of the possible role of calretinin in their pathogenesis. One case each of follicular ameloblastoma, plexiform ameloblastoma, acanthomatous ameloblastoma, desmoplastic ameloblastoma, unicystic ameloblastoma, ameloblastic carcinoma, adenomatoid odontogenic tumor, calcifying epithelial odontogenic tumor, and odontogenic tooth germ were selected from the archives of the Department of Oral Pathology and Microbiology, Mahatma Gandhi Postgraduate Institute of Dental Sciences, Pondicherry. The diagnosis in each case was confirmed based upon adequate clinical, radiological and histological parameters. Four micron-sections were cut from the 10% formalin-fixed paraffin embedded wax blocks and immunohistochemically stained with calretinin antiserum using the standardized technique. The sections were deparaffinized with xylene, 2 changes × 10 min and rehydrated through graded alcohols. Antigen retrieval was done using pressure cooker with the slides placed in 0.01 M citrate buffer (pH 6.0–6.2) for 5 min. The pressure cooker was then brought to room temperature immediately with the slides remaining in the buffer for 15 min. The sections were incubated with 3% hydrogen peroxide (to block peroxidase activity) for 10 min at room temperature and rinsed with deionized water and phosphate-buffered saline solution (pH 7.4). All the sections were then incubated with power block (to block nonspecific staining) for 10 min. The sections were then incubated with precisely diluted rabbit polyclonal primary antibody against calretinin (Biogenex, USA) for 60 min at room temperature for all the cases in a humidifying chamber. Incubation with the Super Enhancer was performed for 20 min. Subsequently, the sections were incubated with a secondary antibody conjugated with peroxidase-labeled dextran polymers (Super Sensitive Polymer-HRP Detection system, Biogenex) for 30 min at room temperature and then they were treated with 0.5 mg/ml DAB solution (3,3'-diaminobenzidine) containing 0.001% hydrogen peroxide to visualize brown colored reaction products, and counterstained with Mayer's hematoxylin. The presence of brown color at the site of target antigen was considered positive for calretinin. Immunoreactivity was evaluated with regard to the intensity, pattern and localization of stained cells using conventional light microscopy. In follicular ameloblastoma, positivity was seen only in solid follicles before cystic degeneration. In acanthomatous ameloblastoma, strong positivity was seen in the central areas of follicles. In contrast, peripheral ameloblast-like cells were negative for calretinin. Plexiform ameloblastoma, desmoplastic ameloblastoma, and ameloblastic carcinoma were completely negative for calretinin. Mild positivity was seen in the lining epithelium of the unicystic ameloblastoma, but the mural follicles were negative. Mild positivity of the epithelial cells and few amorphous areas of the calcifying epithelial odontogenic tumor was noticed. Mild positivity of the few epithelial cells was seen in adenomatoid odontogenic tumor. In tooth germ, few stellate reticulum cells were positive for calretinin. There is still uncertainty hovering over the specific function of calretinin, but a role in intracellular calcium transport or calcium buffering in the nerve cells has been suggested., However, at present, a calcium modulator is thought to be the one that regulates other calcium sensors. The present study was undertaken to evaluate the expression and role of calretinin in selected odontogenic tumors. In the present study, localization of calretinin immunoreactivity was restricted to the central stellate reticulum-like cells in all the positive cases. The prominent reactivity was observed particularly in areas of squamous metaplasia within the stellate reticulum-like cells and those lining cystic degeneration [Figure 1]. Contrastingly, peripheral ameloblast-like cells were negative for calretinin [Figure 2]. However, the reasons for this distribution of calretinin are not well studied in the literature. The localization of calretinin reactivity in stellate reticulum-like cells observed in our study appeared similar to the late bell stage of normal tooth odontogenesis. In addition, calretinin expression was negative in secretory ameloblasts during odontogenesis that are mature or differentiated cells. Similar to these findings, in our study, peripheral ameloblast-like cells were negative for calretinin expression. With these findings, it is pertinent to imply that a cell as it undergoes differentiation it loses the expressivity of calretinin and has a definite role before differentiation. This was also supported by Altini et al., who suggested that calretinin expression in some cells varies according to their metabolic activity and may be lost when this activity changes. In our study, calretinin expression was particularly intense in the cells lining the microcysts and macrocysts formed because of cystic degeneration within the stellate reticulum-like cells and also the areas showing squamous metaplasia. This tendency for expression by the squamous cells agrees with the study by Doglioni et al. of calretinin expression in keratinizing epithelial cells of the thymus and in the superficial layer of the pilar infundibulum. This was also similar to the findings of Alaeddini et al. who observed calretinin immunopositivity almost exclusively in the stellate reticulum-like cells in all ameloblastomas which was also in accordance with the findings of Altini et al. and Coleman et al. Alaeddini et al. also stated that ameloblastomas were consistently reactive for calretinin in contrast to the other studied tumors which were nonreactive and he hypothesized that this protein is one of the factors responsible for the aggressive nature of ameloblastoma and other odontogenic tumors. Plexiform ameloblastoma, desmoplastic ameloblastoma, and ameloblastic carcinoma were completely negative for calretinin. Currently, there is no literature available to support this evidence and the reason for the complete negativity is also not clear. Sandra et al. have also shown that two relatively distinct areas are seen in ameloblastomas, an antiapoptotic proliferating site in the peripheral layer and a proapoptotic site in the central layer of the tumor islands. Hence, we can hypothesize that variability in the expression of calretinin between the peripheral and central cells might be because of antiapoptotic and proapoptotic functions. Luo et al. also showed that, in ameloblastomas, the expression of proapoptotic proteins was mainly detected in the foci of squamous metaplasia and the center of tumor islands showing cystic degeneration, suggesting that the cystic change within the tumor islands of ameloblastoma may be associated with apoptotic processes. A similar pattern of expression was evident in the present study both in squamous metaplasia and in the areas of cystic degeneration. With these findings, we can conclude that calretinin plays a certain role in apoptosis, which can be confirmed further when calretinin and apoptotic markers are carried out together on the same lesions. Mild positivity of the epithelial cells and few amorphous areas were noticed in the calcifying epithelial odontogenic tumor. This was not consistent with the findings of Alaeddini et al. and Friedrich et al. who found complete negativity for calretinin. This was probably because the tumor cells of CEOTs bear a close morphological resemblance to the cells of the stratum intermedium of the enamel organ and the stratum intermedium is weakly immunoreactive in the early bell stage of normal rat tooth germs. With regard to the adenomatoid odontogenic tumor, only mild positivity of the few epithelial cells was seen, which was in accordance with the study conducted by Alaeddini et al. 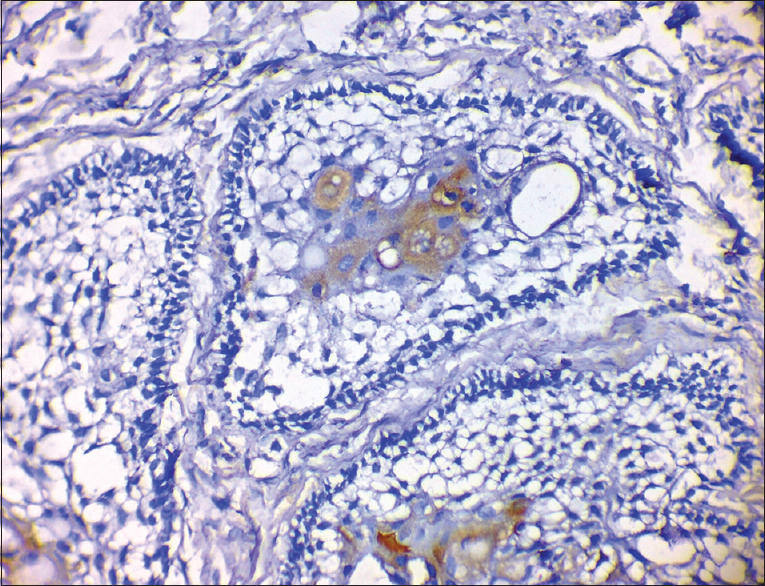 In normal rat molars, the expression was observed mainly in the inner enamel epithelium and presecretory ameloblasts, which are assumed to be the cells of origin of this tumor. Alaeddini et al. have postulated that either the role of calretinin in the development of this tumor is minimal or there is little correlation between the staining of normal presecretory/secretory ameloblasts and adenomatoid odontogenic tumor. The potential mechanism resulting in the different expressions of calretinin in these tumors is mainly because of its role as an apoptotic and cell cycle regulator. The process of apoptosis and cell cycle regulation is disturbed in ameloblastoma. 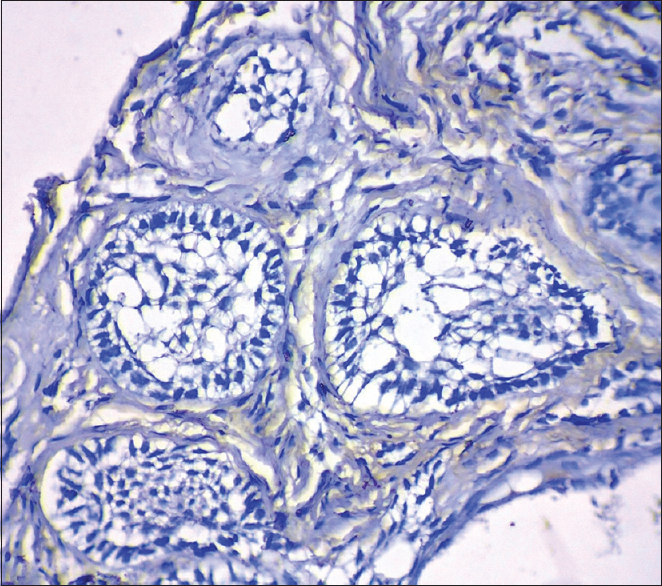 In the present study, ameloblastomas showed a number of individual darkly staining nonepithelial cells in the fibrous connective tissue. These findings were similar to the findings by Coleman et al., Piattelli et al., and De Villiers et al. The nature of these cells can be identified as mast cells because of their morphology and their nondentritic nature, and finally because of calretinin expressivity in the mast cells having been documented previously. The study was performed to assess the expression of calretinin in odontogenic tumors. The expression was primarily in the cytoplasm. The follicular areas before degeneration show positivity, whereas the degenerated areas were negative. In some cases the expression is prominent in stromal component. The calretinin seems to play a role in neoplastic transformation. Calretinin is consistently expressed in the ameloblastomas, and hence it is suggested that calretinin might be used as a specific immunohistochemical marker for the ameloblastomas and could play an important role in the differentiation of aggressiveness of different odontogenic tumors. Depending on the cell regulatory processes of calretinin, we suggest a definite role of calretinin in the pathogenesis of ameloblastomas and have to be further studied along with other proliferative cell cycle and apoptotic markers with larger sample size. Camp AJ, Wijesinghe R. Calretinin: Modulator of neuronal excitability. Int J Biochem Cell Biol 2009;41:2118-21. Rogers J, Khan M, Ellis J. Calretinin and other CaBPs in the nervous system. Adv Exp Med Biol 1990;269:195-203. Billing-Marczak K, Kuźnicki J. Calretinin – Sensor or buffer – Function still unclear. Pol J Pharmacol 1999;51:173-8. Groves P, Palczewska M. Cation binding properties of calretinin, an EF-hand calcium-binding protein. Acta Biochim Pol 2001;48:113-9. Dei Tos AP, Doglioni C. Calretinin: A novel tool for diagnostic immunohistochemistry. Adv Anat Pathol 1998;5:61-6. Doglioni C, Dei Tos AP, Laurino L, Iuzzolino P, Chiarelli C, Celio MR, et al. Calretinin: A novel immunocytochemical marker for mesothelioma. Am J Surg Pathol 1996;20:1037-46. Ordoñez NG. Value of calretinin immunostaining in differentiating epithelial mesothelioma from lung adenocarcinoma. Mod Pathol 1998;11:929-33. Mistry D, Altini M, Coleman HG, Ali H, Maiorano E. The spatial and temporal expression of calretinin in developing rat molars (Rattus norvegicus). Arch Oral Biol 2001;46:973-81. Altini M, Coleman H, Doglioni C, Favia G, Maiorano E. Calretinin expression in ameloblastomas. Histopathology 2000;37:27-32. Alaeddini M, Etemad-Moghadam S, Baghaii F. Comparative expression of calretinin in selected odontogenic tumours: A possible relationship to histogenesis. Histopathology 2008;52:299-304. Coleman H, Altini M, Ali H, Doglioni C, Favia G, Maiorano E, et al. Use of calretinin in the differential diagnosis of unicystic ameloblastomas. Histopathology 2001;38:312-7. Sandra F, Nakamura N, Mitsuyasu T, Shiratsuchi Y, Ohishi M. Two relatively distinct patterns of ameloblastoma: An antiapoptotic proliferating site in the outer layer (periphery) and a pro-apoptotic differentiating site in the inner layer (centre). Histopathology 2001;39:93-9. Luo HY, Yu SF, Li TJ. Differential expression of apoptosis-related proteins in various cellular components of ameloblastomas. Int J Oral Maxillofac Surg 2006;35:750-5. Friedrich RE, Zustin J. Calcifying epithelial odontogenic tumour of the maxilla: A case report with respect to immunohistochemical findings.In Vivo 2011;25:259-64. Piattelli A, Fioroni M, Iezzi G, Rubini C. Calretinin expression in odontogenic cysts. J Endod 2003;29:394-6. DeVilliers P, Liu H, Suggs C, Simmons D, Daly B, Zhang S, et al. Calretinin expression in the differential diagnosis of human ameloblastoma and keratocystic odontogenic tumor. Am J Surg Pathol 2008;32:256-60.